With a life that spanned more than 100 years and a catalogue that boasted over 1,000 songs, Irving Berlin epitomized Jerome Kern's famous maxim that "Irving Berlin has no place in American music - he is American music." 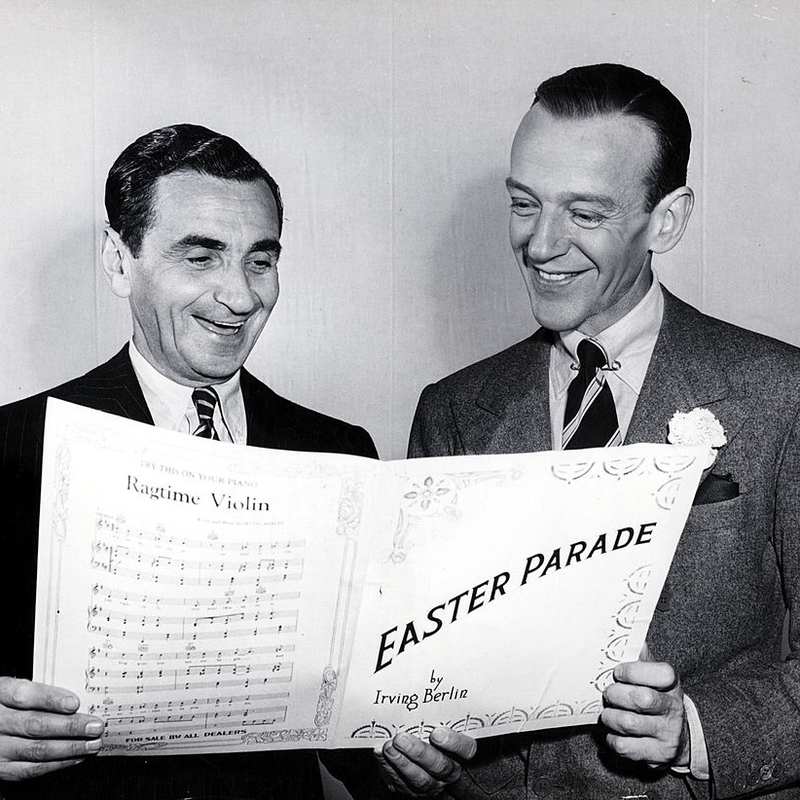 Irving Berlin was born Israel Beilin on May 11, 1888. One of eight children, his exact place of birth is unknown, although his family had been living in Tolochin, Byelorussia, when they immigrated to New York in 1893. When his father died, Berlin, just turned 13, took to the streets in various odd jobs, working as a busker singing for pennies, then as a singing waiter in a Chinatown Cafe. In 1907 he published his first song, "Marie from Sunny Italy," and by 1911 he had his first major international hit "Alexander's Ragtime Band." Over the next five decades, Irving Berlin produced an outpouring of ballads, dance numbers, novelty tunes and love songs that defined American popular song for much of the century. A sampling of just some of the Irving Berlin standards includes "How Deep Is The Ocean," "Blue Skies," "White Christmas," "Always," "Anything You Can Do," "There's No Business Like Show Business," "Cheek To Cheek," "Puttin' On The Ritz," "A Pretty Girl Is Like a Melody," "Heat Wave," "Oh! How I Hate To Get Up In The Morning," "Easter Parade" and "Let's Face The Music And Dance." In a class by itself is his beloved paean to his beloved country, "God Bless America." He was equally at home writing for Broadway and Hollywood. He wrote seventeen complete scores for Broadway musicals and revues, and contributed material to six more. Among the shows featuring all-Berlin scores were The Cocoanuts, As Thousands Cheer, Louisiana Purchase, This Is The Army, Miss Liberty, Mr. President, Call Me Madam and the phenomenally successful Annie Get Your Gun. Recent musicals culled from his screen work include Irving Berlin's White Christmas (Broadway, across the USA, Canada and Great Britain), and Top Hat, winner of the 2013 Laurence Olivier Award for Best New Musical. Among the Hollywood movie musical classics with scores by Irving Berlin are Top Hat, Follow The Fleet, On The Avenue, Alexander's Ragtime Band, Holiday Inn, Blue Skies, Easter Parade, White Christmas and There's No Business Like Show Business. His songs have provided memorable moments in dozens of other films as wide apart in space and time as The Jazz Singer (1927), Home Alone (1991) and Titanic (1997) to The Simpsons (2006), Spider Man 3 (2007) and Downton Abbey (2011). Among his many awards are a special Tony Award (1963) and the Academy Award for Best Song of the Year for "White Christmas" in 1942. An intuitive business man, Irving Berlin was a co-founder of ASCAP (American Society of Composers, Authors and Publishers), founder of his own music publishing company, and with producer Sam Harris, builder of his own Broadway theatre, The Music Box. An unabashed patriot, his love for - and generosity to - his country is legendary, exemplified by his establishing The God Bless America Fund, which receives all income from his patriotic songs and distributes it to the Boy Scouts and Girl Scouts. His actions were acknowledged with such accolades as the Army's Medal of Merit from President Truman in 1945; a Congressional Gold Medal for "God Bless America" and other patriotic songs from President Eisenhower in 1954; and the Freedom Medal from President Ford in 1977. In 2002, the U.S. Army at Fort Belvoir, Virginia, named the Army Entertainment Division (AED) World Headquarters "The Irving Berlin Center" in his honor. Also that year he was commemorated on a U.S. postage stamp. On September 22, 1989, at the age of 101, Irving Berlin died in his sleep in his town house in New York City. A widower since his wife of 62 years, the former Ellin Mackay, had died the previous year at the age of 85, Berlin was survived by three daughters and their families at the time of his death.